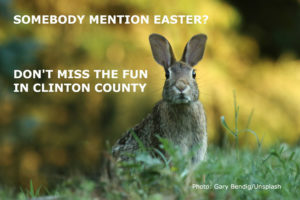 Have A Happy Easter In Clinton County, Illinois! Fish fries, colored eggs, and festive Sunday brunches highlight the Easter season here in Clinton County, Illinois. This is family time and if you have relatives visiting, you’ll find lots of delicious ways to entertain them—and forgo cooking too! There are still a few weeks left to enjoy the Friday night Lenten Fish Fry hosted by the American Legion in Beckemeyer. The tasty dinner includes catfish, cod, shrimp, and blue gill served with slaw and your choice of French fries or mac and cheese. Eat in and enjoy the camaraderie or if you prefer, you can get your meal to go. Fridays, 4:30 p.m. – 7:00 p.m.
Who says kids get to have all the fun? Hidden Lakes Winery is giving grown-ups a chance to get in on the action at an Adult Easter Egg Hunt, Friday, March 23. Bring a flashlight and something to hold all the eggs you’ll collect. There will be live music, prizes awarded, and of course, wine will be enjoyed! Registration and check-in, 6:30 p.m.
Live Music, 6:00 p.m. – 10:00 p.m. Treat the family to something special this Easter with Champagne Brunch at Bretz Wildlife Lodge and Winery. This annual event is always popular and a festive way to celebrate the holiday. The extensive buffet includes breakfast favorites, such as biscuits and gravy and pancakes; plus dinner specialties, including fried chicken, ham, and beef brisket with a range of delicious side dishes and desserts. Planning dinner at home this year? Make it extra yummy with cute bunny cookies or one of the other sweet treats you’ll find at Berkemann’s Bakers Dozen. No matter the season, this local bakery always makes it festive. Happy Easter from Clinton County, Illinois! This entry was posted in Events, Food & Drink, Holidays, Local Businesses, Winery and tagged Clinton County attractions, Clinton County dining, Clinton County event, Wineries by admin. Bookmark the permalink.